Personalise the front of this Me To You Balloon Chocolates Bar with a name up to 12 characters long and a number up to 2 characters long. The number will appear inside the balloon (you can leave it blank if no number is desired). On the reverse you can then add a further message over 3 lines of up to 20 characteres per line. All personalisation is case sensitive and will appear as entered. 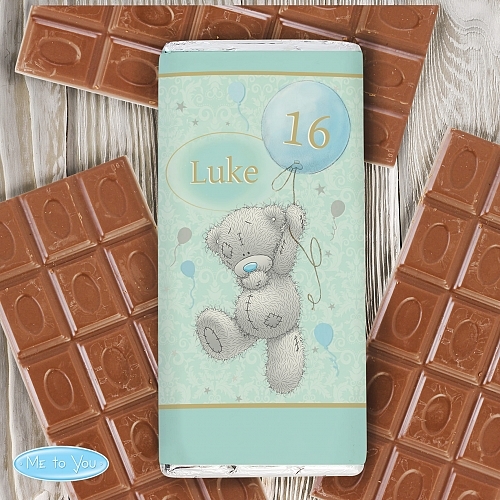 What's more our great value Chocolates includes free standard delivery and are available on next day.Milk Chocolates Bar15cm x 7cm x 1cmWeight 100gMay contain traces of nutsPerfect for Birthdays. Personalised Gifts and Presents For Gift Delivery in UK!